On Friday, 19 students from seven LA Unified schools will participate in a cook-off that will send a team to compete nationally in Washington, D.C. Their task: to create a nutritionally balanced school meal for $1.14, the district’s lunch budget. Their challenge is not unlike one the massive LA Unified Food Services division is facing: how to feed more than 640,000 kids daily for $50 million less a year. According to November’s report of the Independent Financial Review Panel, Food Services has been a drain of about a $50 million a year on the district’s general fund, or $168.6 million over the past four years. In short, the division needs to pay for itself, the report said. Laura Benavidez, the district’s interim co-director of food services, said the division is “constantly working to drive down costs” even as their meals programs have included free breakfasts for all students and suppers at some schools. “Our biggest costs are food and labor.” The district serves 127.8 million meals at 1,100 locations each year. LA Unified’s average cost of all meals–breakfasts, lunches and dinners–is $1.70 per meal with the five requirements per serving. The restrictions and nutritional requirements are more rigorous at LA Unified than at the national or statewide levels. “We’re able to provide more nutritional meals than the standards set at the national and state levels, and we’re always working on improving them,” Benavidez said. Although there are no solid statistics comparing the cost per lunch at independent charter schools, Benavidez said the general costs for charter school lunches are $3.50 per meal. 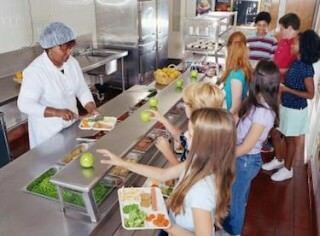 Nationally, the School Nutrition Association estimates private school lunches are made at $3.72 a serving, while the average traditional public school lunch is made at $1.20 a plate with the same nutritional requirements. Some local independent charter schools have lunches for their students at $6 or $7 a meal, Benavidez said. Parents pay the extra costs for the homemade catered meals. Currently, more than 2,800 students at 11 of the 211 independent charter schools in LA Unified are contracting out meals from the district’s Food Services department, Benavidez said. The charter schools are charged the same price as the rest of the district. 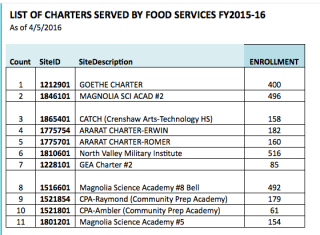 Other than setting the price for those charters that contract with the district, LA Unified has no other oversight or controls over meals served at independent charter schools. Although the district is responsible for monitoring charters and approving them in the district, that doesn’t include the food. Benavidez said, however, that if the staff sees something when visiting a charter site, the school will be notified of issues. But LA Unified’s own rules are more rigorous. For example, some independent charter schools may allow chocolate milk to be served, which state rules allow, but LA Unified does not. Last month, the school board voted to make it the first large school district serving antibiotic- and hormone-free chicken and turkey. LA Unified is part of the Urban School Food Alliance, which is made up of the largest school districts in the nation, including New York, Chicago, Miami, Orlando and Dallas. 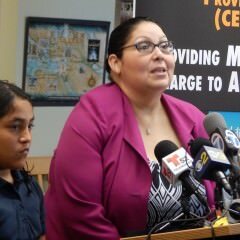 Together they are asking for triple the amount of money now provided per school lunch by the USDA, Benavidez said. LA Unified has 18 high schools and two middle schools with culinary academies that offer cooking tracts. Teams from seven of them will cook in Friday’s competition at Los Angeles Trade Technical College. Culinary students from Los Angeles Center for Enriched Studies will also participate in Friday’s competition but won’t be eligible to win the D.C. trip because they are middle schoolers. The winning team will get an all-expense-paid trip to Washington, D.C., to compete in the “Cooking up Change” National Competition against other students from Chicago, Houston, Dallas, St. Paul and other parts of the country. The only other California school district participating in the national competition is Orange County. This is the third time LA Unified has participated in the 9-year-old competition. The last year LA Unified participated, in 2014, the team from Manual Arts Senior High School won second place. Fame comes along with the free trip too.